Clearwater sails rain or shine, and so will we! Please arrive no later than 9:45 am. Join us aboard an authentic working Tall Ship – the Hudson River Sloop Clearwater. This three-hour sail on the beautiful Hudson River will include dockside orientation before departure, Clearwater’s history, wildlife observation, education, even a chance at steering the ship. Music by the crew and sing-a-longs. Refreshments available at the dock. Clearwater is a 106 foot long wooden sailboat, with one 108 foot tall mast. In the 1800’s such boats were a common sight on the Hudson and Long Island Sound; now, ships like Clearwater are a rare sight. This is a benefit for the Rensselaer Land Trust and the Hudson River Sloop Clearwater. You will help to sail her: raising the mainsail and taking a turn at her tiller. The best way to ensure that your sail is enjoyable is to be prepared for what you’ll encounter on a real, working tall ship. Clearwater sails rain or shine with the exception of severe weather, so be sure to check the forecast and dress accordingly. If there’s even a small chance of rain, bring rain gear. If it’s cold wear clothing in layers, with a warm coat, sweater, long pants, scarf, and hat. If the day is warm, bring a light jacket or windbreaker; it’s often colder on the water than on land. If it’s sunny, a brimmed hat, high SPF sunscreen, and sunglasses should be worn. Wear flat, soft-soled shoes. No clogs, flip flops or high heels should be worn onboard. In any weather, make sure you wear clothing you can easily move around in and don’t mind getting dirty. Hydration is extremely important while sailing; we strongly suggest bringing a re-useable water bottle. You will not eat lunch onboard, but are welcome to bring a snack. If you’d like to bring a camera, you may. It is important to always be aware of what is going on around you and note that there are appropriate times to take photos. For the safety of you and your devices, cell phones, iPods, portable music devices, and tablets should not be taken onboard. They are easily broken and can be distracting. Headphones prevent passengers from hearing important information or directions from the captain and crew. Backpacks can be bulky and often get in the way. Many of the docks have facilities available on site and you are encouraged to use them before boarding the boat. Clearwater’s head, or boat toilet, is rustic; more like an outhouse than a bathroom. There is a barrel of wash water for hand washing on deck. You are in good hands when onboard! Clearwater’s professional crew has been selected to combine the talents of a competent sailing team with those of a trained education staff. It is important to listen closely to the captain, crew and to your teachers, and to always follow the basic safety rules outlined at the beginning of your sail. After 30 years there’s many people to thank for land conservation in Rensselaer County. We’ll do so at our Annual Meeting and 30th Anniversary Celebration this fall! We’ll take time to honor our donors, volunteers, and current and former board members and staff. We will hear from outgoing County Executive Kathy Jimino and Troy Mayor Patrick Madden. We’ll pay tribute to our founders and our past RLT presidents, board members, and staff including Christine Young, our former executive director, who guided RLT so ably for nine years. And we will welcome our new Executive Director, John Winter. William Niemi Conservation Leadership Award will be presented to ecologist Dr. David Hunt for his many years studying the plants, animals, and natural communities of Rensselaer County, advocating for their conservation, and providing ecological expertise to landowners, towns, and conservation organizations." 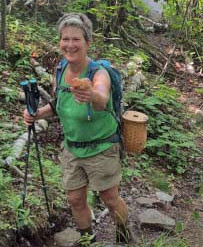 Volunteer of the Year Award will be presented to Marcy Steinberg for her years of volunteer work including Trail Crew, a member of the Outings Committee, and providing support as coordinator for the Mushroom Series. As a special treat, George Wilson, local renowned fiddler, multi-instrumental virtuoso, and singer will perform a variety of traditional and folk styles. George has mastered nearly 500 tunes from New England, Quebec, Cape Breton, Scotland, Ireland, and Shetland. Learn more about George Wilson here. Please join us as we celebrate at Brown's Brewing Co.'s Revolution Hall, 417 River Street, Troy, NY 12180. Parking is available at the site. Tickets are $30 per person, which includes a platted dinner, sides, and dessert. Cash bar. Includes buffet dinner. Cash bar available. This year please consider joining our Annual Meeting's Host Committee at a gift level of $100 or more. Contributors who give $100 or more will be recognized as members of the Host Committee in the Annual Meeting's program. Join our Board of Directors and Executive Director, John Winter, as he presents two exciting new RLT plans: our 2018 to 2030 Rensselaer County Conservation Plan and our Hudson River Access Plan. The 2018 to 2030 Land Conservation Plan was designed as a “greenprint” of land conservation priorities in Rensselaer County and identifies and maps the natural resources that RLT and its partners are looking to conserve. The Plan is the first comprehensive study of this kind for the entire county and was prepared in collaboration with public and private partners and stakeholders. The Plan also identifies key conservation priorities in each municipality in the County. The Hudson River Access Plan identifies places along the Hudson River waterfront where residents and visitors can access the water. It was prepared using information on existing conditions at 44 sites and provides recommendations for improved access along the entire Rensselaer County waterfront. When implemented, with direct involvement of each river community, Rensselaer County will have a significantly more accessible waterfront. 2018 marks the third year that the Land Trust will be honoring two individuals at our Annual Meeting. Peter Wood will receive the Volunteer of the Year Award and David Fleming, Supervisor of the Town of Nassau, will receive the William Niemi Conservation Leadership Award. Peter Wood is the Steward of the Robert Ingalls Preserve in Stephentown. A longtime supporter of the Rensselaer Land Trust, Peter is a regular participant in the weekly Trail Crew, RLT’s representative to Celebrate Stephentown, and an active member of the Outings Committee. As Ingalls Steward, he has expanded the trail network, maintained the parking lot, and been an ambassador to visitors, keeping the kiosk up to date with information, leading many hikes that highlight the history of this beautiful property on the Black Creek. Peter is the guy who will research the rare plant found by the Trail Crew and suggest a trail reroute to avoid its disturbance. He will send fabulous photos of mushroom blooms for RLT’s Facebook page because he finds such delight in them. The Rensselaer Land Trust is very fortunate to have Peter as a supporter and volunteer. David Fleming has earned the William Niemi Conservation Leadership Award for his strong record of doing the right thing for the environment and for successfully protecting the natural resources of Rensselaer County. 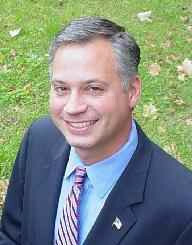 David has been Supervisor of the Town of Nassau since 2008. As Supervisor, he was a leader in the successful fight to stop the Kinder Morgan pipeline. He has been tireless in the battle to clean up the Dewey Loeffell Superfund site and to prevent a hard rock mine in a residential neighborhood – using the courts, science-based evidence, and a lot of determination. 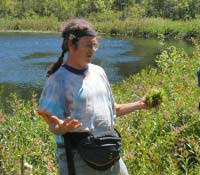 David led the establishment of the Town of Nassau’s Mud Pond Preserve, with public trails around a rare peat wetland. David has supported RLT’s Kinderhook Creek Preserve in Nassau, and he also is a friend and supporter of the Rensselaer Plateau Alliance and the Agricultural Stewardship Association. In addition to his Town Supervisor duties, David is Chief Operating Officer of Featherstonhaugh, Wiley & Clyne, LLP, and a leading consultant on cemetery regulation and operations. RSVP by May 18 by clicking on this link. Enjoy a delicious meal in downtown Troy at the Illium Cafe Bistro, while supporting your local land trust. We need 20 advance reservations for the GroupRaise event to take place. Rensselaer Land Trust receives 15% of receipts put in the jar, not including tax, tip, or alcohol. Please share with your friends and family and have a wonderful evening!